If you’ve ever been to Disneyland or Universal Studios, you’ll be familiar with the way techniques and artistry borrowed from the film industry are used to turn empty plots of land into incredible, themed worlds. While the skills and tricks used are the same, on most film sets in the 21st Century, the scale is much less grandiose. To keep costs down, the majority of productions build only sections of the sets you see in the finished film — often keeping supposedly contiguous parts of a set in separate soundstages — then tie them together with clever editing and post-production VFX. In some ways, this practical reality strips away some of the romance of film production, because while these sets are often still impressive, the illusion they create is usually broken the moment one steps round a corner, and emerges into a car park. 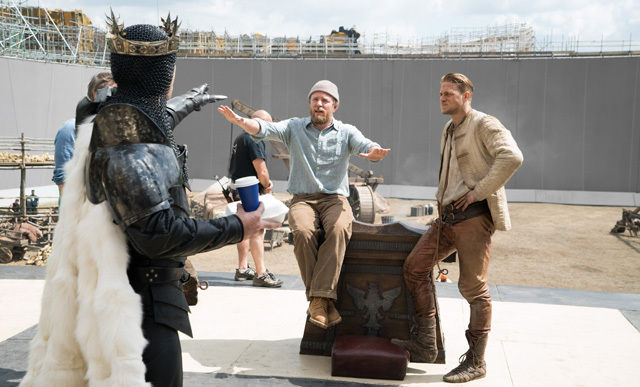 Which is why, when ComingSoon.net ventured down to London’s Leavesden Studios for a visit to the set of Guy Ritchie’s forthcoming King Arthur: Legend of the Sword, we were so surprised to find ourselves standing in the centre of 6th Century London, on a set the size of a city block. From our perspective, surrounded by towering, medieval buildings that took nearly five months to construct, it’s hard to see how this could possibly be described as ‘normal.’ It’s not so much the sets that are impressive, as it is the scale of the production, because in addition to the buildings, everywhere we look there are armour-clad background actors and stunt performers, milling around, waiting for a take. And this, we’re led to believe, is one of the relatively quiet days. And it’s not just wardrobe and makeup personnel who are needed when working with a cast that numbers in the hundreds, but, according to costume designer Annie Symons, a small army of fabricators as well. 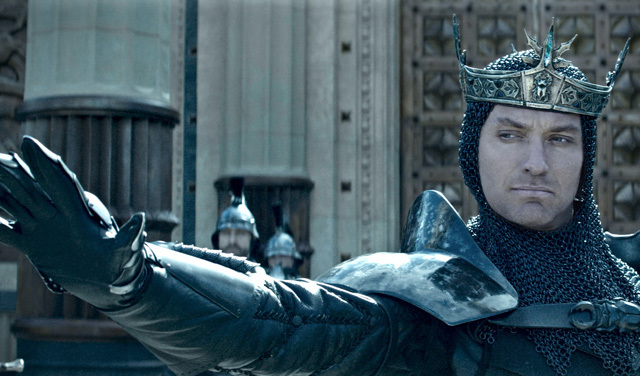 These fabricators worked on creating the armour for the Blacklegs – the black-clad enforcers terrorising the English countryside on behalf of Jude Law’s villainous Vortigern. In one of the Studios’ office buildings, production designer Gemma Jackson shows us a model of her set for Londinium — London about two centuries after the Romans left Britain — and talks us through some of the key elements. It’s only when we see the miniature that features the layout, and the sheer size of the set becomes clear. What is remarkable about this is that these practical elements represent only a portion of what we’ll see on screen, as they will end up being augmented with VFX work in the finished movie. “We did something strange and wonderful. I didn’t think it was gonna work at all, but it did. Guy had this wacky idea that he wanted to take an afternoon before we started working and shoot the whole film in four hours. On two or three cameras and in a room all in black. We shot the whole film, and that’s where we met. That’s where most of the cast met. It was a baptism of fire. It was such a high-energy, sort of anxiety-inducing experience. 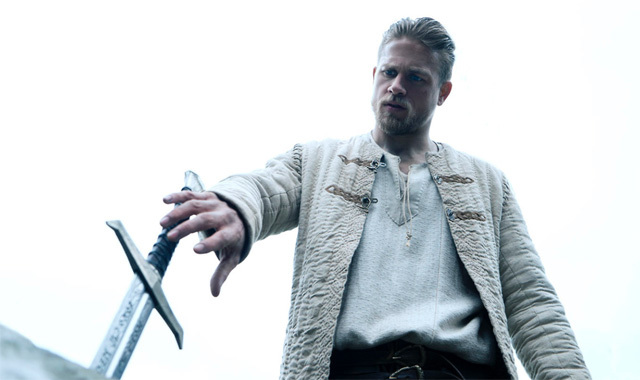 While Hunnam describes the majority of the scenes they’ve shot as “kind of a straight, character-driven drama,” by the time we got to set, the production had been rolling for several months, and the team were going in to the last few weeks of filming – which involved three solid weeks of action sequences. 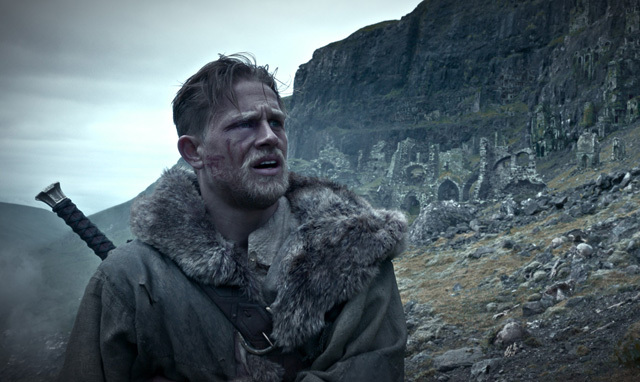 King Arthur: Legend of the Sword opens in theaters on May 12, 2017.